Lock um up.... grand jury indictment... again this grand jury knows the seriousness of the political aspects and they have voted to put him on trial. Though the right wing has gone after Hillary and bill for over 30 years, they never secured one grand jury indictment to one single Clinton person. And that was with two ultra partisan right wing independent councils. Imagine if we could one get an independent counsel and second two independent councils and third all ultra-partisan dems. New York Times reporter Matt Apuzzo joins Morning Joe by phone to discuss the breaking news that former Trump Campaign Chair Paul Manafort has surrendered to the FBI. wow one goes down already a Whitehouse advisor caught lying. Again here we have the first conviction of a trump adviser. wow in only 9 months in office his top people convicted... Is that record-setting for any administration in the history of the USA? actually he may have plead guilty months ago it was under seal. So they could wire him up? in a court filing, the government has asked the judge to seal the case because ... wow... papaD is co-operating with the government and is critical he was arrested months ago and it was sealed. So was he wearing a wire like they usually do? 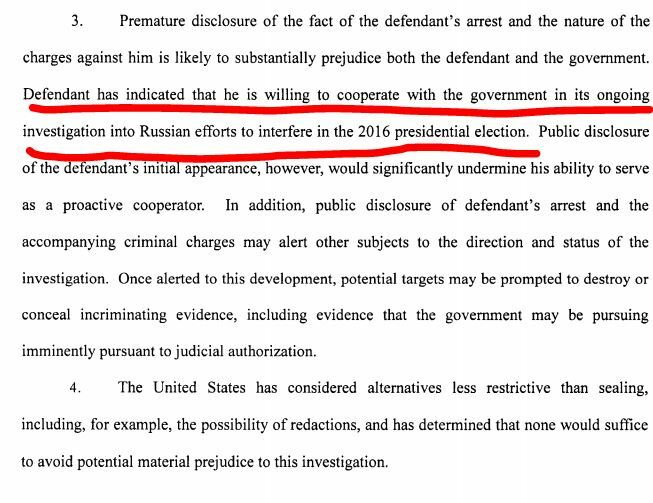 That the first indictment is against Paul Manafort … not a surprise. That the charges covers more than a decade of activity … not a surprise. That the very first charge on the very first indictment returned by Special Counsel Robert Mueller is Conspiracy Against the United States … that’s jaw-dropping. That charge also makes it clear that Manafort and his partner Rick Gates were not a conspiracy of two, as the count includes the language “together with others” in describing their conspiracy to interfere with both the Department of Justice and the Treasury Department. And the timeline covered by the charges explicitly includes the period in which Manafort served as campaign chairman for Donald Trump. 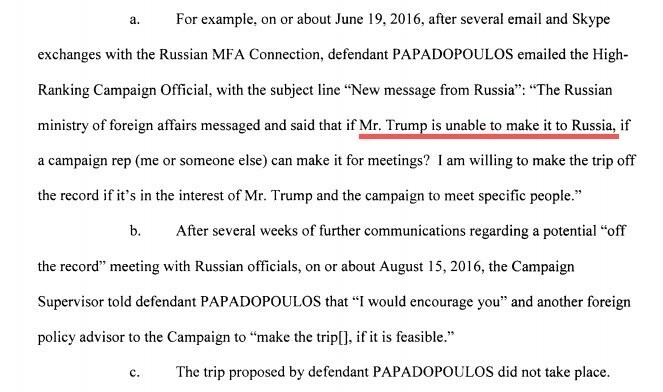 Which certainly opens the possibility that the conspiracy charges may expand to cover more names related to the Trump campaign. What’s also notable about these charges is just what they are not. They are not based on personal testimony. They are not based off of transcripts of discussions between Manafort and others. They are not vague, or debatable, or in any sense small. These are detailed charges backed up by hard numbers and details of specific transactions. And while Trump’s defenders are rushing to declare that the indictments are “all about business,” the nature of that business is a thunderclap of doom for Trump. At the heart of the charges is one thing: The way in which oligarchs from Russia and other former Soviet states have used the New York real estate market as a means of bringing money into the United States. That’s a practice that includes not just Manafort, but Michael Cohen, Jared Kushner, Donald Trump Jr., and the other Donald Trump. Mueller is asking questions about Trump ally Roger Stone, who claimed he had connections to Wikileaks founder Julian Assange during the 2016 campaign. Ari Melber lists the unanswered questions surrounding Roger Stone and his role in the Trump-Russia collusion case. Former Trump campaign adviser Sam Nunberg and Roger Stone’s alleged intermediary to Julian Assange join Ari Melber on The Beat. In 2010 an explosion at a coal mine operated by Massey Energy killed 29 men. In 2015 Don Blankenship, the company’s former C.E.O., was sent to prison for conspiring to violate mine safety standards. In 2018, Blankenship appears to have a real chance at becoming the Republican candidate for senator from West Virginia. Blankenship is one of four Republicans with criminal convictions running for office this year, several of whom may well win their party’s nominations. And there is a much broader list of Republican politicians facing credible accusations of huge ethical lapses who nonetheless emerged victorious in G.O.P. primaries, ranging from Roy Moore to, well, Donald Trump. To be sure, there have been plenty of crooked Democrats. But usually the revelation of their crookedness ended their political careers. What’s striking about today’s Republican landscape is that people who are obvious crooks, con men or worse continue to attract strong support from the party’s base. Moore narrowly lost in Alabama’s special election, but he received 91 percent of the votes of self-identified Republicans. And Trump, although unprecedentedly unpopular for a president at this stage of his term, continues to receive overwhelming support from the G.O.P. base. Some Republican politicians have openly admitted that this makes the party’s congressional wing unwilling to hold Trump accountable for even the most spectacular malfeasance, up to and including possible collusion with a hostile foreign power. Don Blankenship should still be in jail, and his enablers should be out of office. They are killing people by dismantling safety and health regulations. Have they no shame? Oh, now THERE'S an unbiased list, I'm sure. Like there are no corrupt Democrats besides ... ohhh ... Clinton, Clinton, Comey, Obama, Holder, Lerner, Miller, Napolitano, Susan Rice, Sebelius, Lynch, Emanuel(s), and hundreds more. All this thread shows is your lack of objectivity. How about corrupt POLITICIANS? Anyone who needs proof of any on that list are too uninformed to waste time on. Besides, what does it accomplish to discuss them here? what a false equivalency that any child with a brain could figure out. you low level thinker, the right wing controlled the house for the last 6 years or so under obama and had hearing continuously controlled by them and could not find a single major issue ever that was indictable. 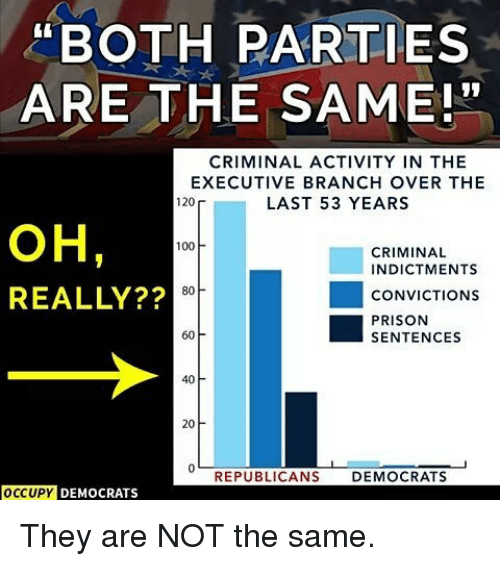 Then under Clinton same they controlled and held hearing and had 2 prosecutors who could not find one grand jury to indict and those were right wingers ultra partisan. You idiots has a independent cousel on carters peanut farn because you claimed he was making extra money on his peanuts from his small farm. Here is a good take about manafort and Page knew their contact during the campaign was a russian intelligence agent. comes near the end.